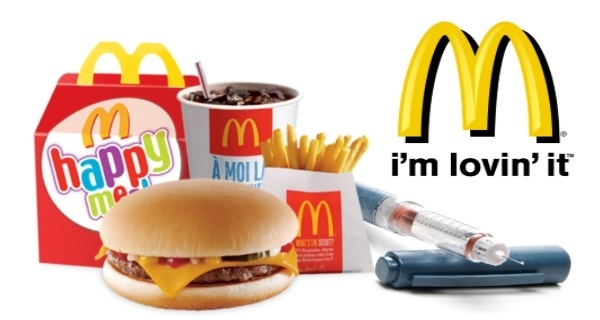 After countless failed attempts to disguise their children’s offerings as “healthy”, McDonald’s has finally decided to just embrace the artery-clogging, blood sugar-spiking nature of their food by replacing Happy Meal toys with insulin. McDonald’s decision comes soon after the fast food juggernaut had to recall 29 million “Step-it!” fitness trackers, their most recent attempt to make Happy Meals appear more health conscious after some customers reported that wearing them caused burns on their wrists. Some parents, like Ohio mother Catherine McNaughton, aren’t happy about the change and are taking to social media to complain. Most of the feedback over the new Happy Meals, however, has been positive. After the success of the new insulin Happy Meals, McDonald’s is considering including putting more medicine into various menu items.